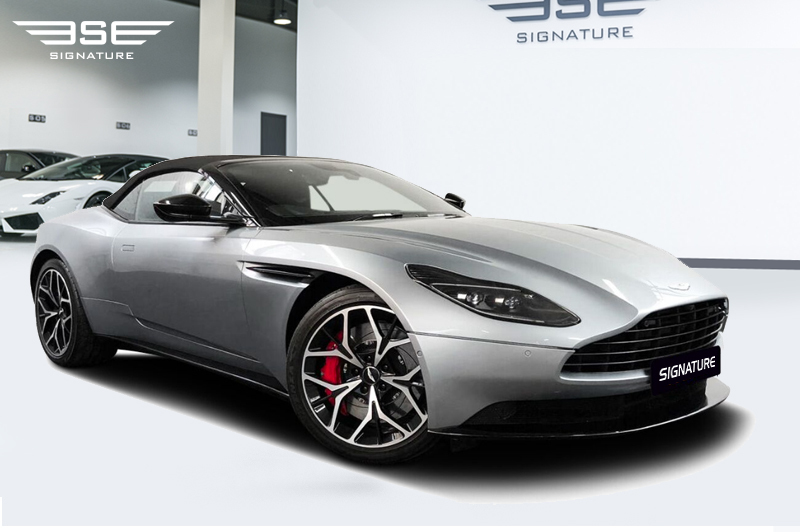 We’ve selected the Volante model for our rental DB11, which offers you the bonus of being able to drop the top on your self-drive car hire experience. There is no mistaking this is an upmarket car, which makes it an ideal car hire choice for long weekend trips in the UK. 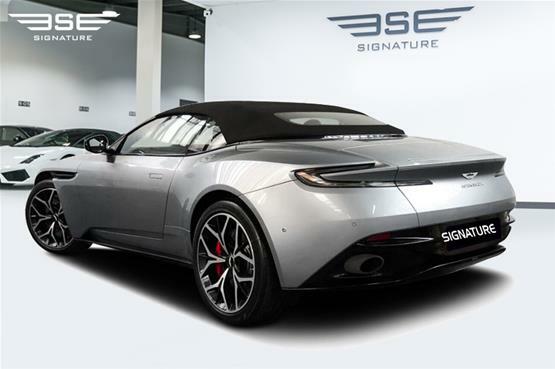 This Aston Martin DB11 Volante hire car is available to rent on a self-drive hire basis in the UK from Signature Car Hire. Whether you are hiring it for a short-term rental or long-term hire, this car can be used both for everyday driving or for a cross-country drive. 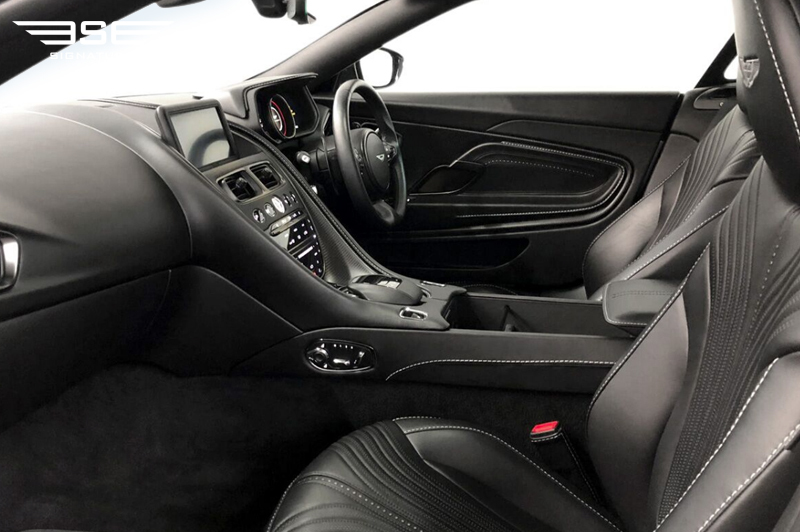 With more emphasis on comfort and refinement than its predecessor, this DB11 Volante rental car benefits from satnav, radio and Bluetooth connection that are all easily to navigate which makes our new DB11 Volante hire car a great on the road rental choice in the UK. It comes with an all-new aluminium platform and a design direction that has been re-freshed. Technical collaboration with Daimler has brought to the rental market a car that offers technologies which include turbocharging, electromechanical power steering, multi-link rear suspension and torque vectoring by braking. 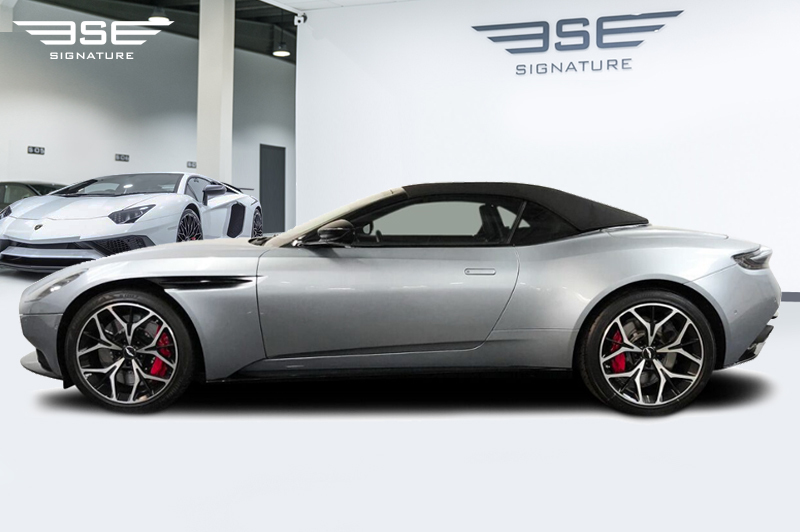 The DB11 Volante boasts a part constructed carbonfibre bodywork, carbon-ceramic brakes, a manual gearbox and no back seats. To transmit its performance to the road, the DB11 has an advanced chassis featuring sophisticated multi-link rear suspension, double wishbone up front and standard-fit adaptive dampers. Our Aston Martin DB11 Volante rental car is one of the fastest and most desirable long-distance cruisers you can rent in the UK today. This DB11 rental car features 8.0in colour multimedia set-up in a docked tablet configuration for your convenience. The system is packed full of features which are responsive and easy to use. 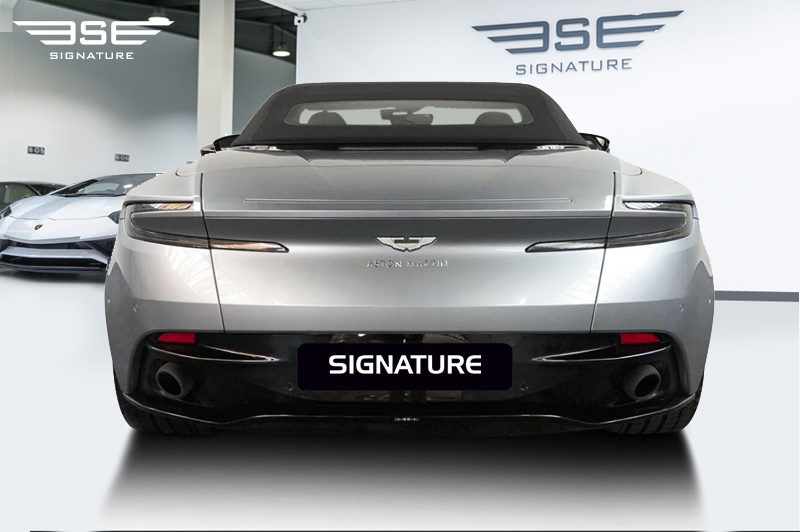 Aston Martin have taken the Mercedes’ Comand Online system and revised it graphically to bring one the of the best systems in-line with their own look and feel. Use the touch-sensitive track pad or rotary wheel to interact with it, alternatively try the voice recognition control. 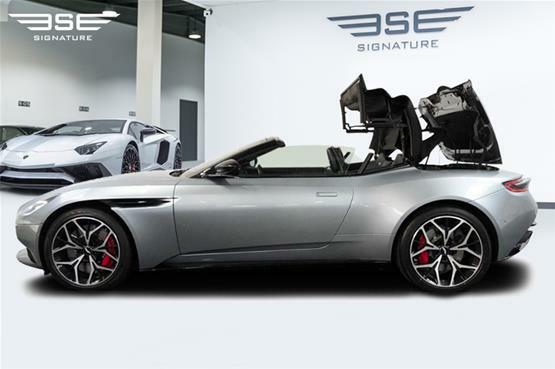 Aston Martin has also allocated 400W of audio power to the DB11 along with DAB radio, Bluetooth media streaming and a wi-fi hub. Heated leather seats, surround-view cameras, cruise control and an infotainment system with a wi-fi hub, DAB radio and a 400W stereo all come as standard. Our rental DB11 Volante features all the refinements you’d expect from this luxury marque, including 20in alloy wheels, switchable dampers, heated and electrically adjustable leather seats, dual-zone climate control, double-glazed side windows, keyless entry and start, cruise control, front and rear parking sensors, a 360deg parking camera, a DAB radio, sat-nav, an 8.0in touchscreen and LED headlights. 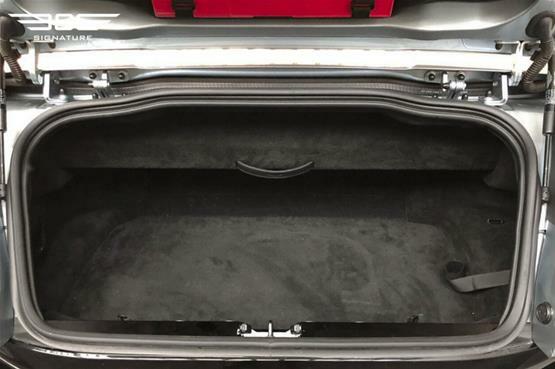 The roof is canvas and folds away at the touch of a button, adding bags more style and elegance to this rental sports car. The roof will effortlessly lower itself in 14 seconds and can close again in just 16 seconds, this can be achieved at speeds of up to 31mph. Nothing is compromised by opting for the soft top. The roof consists of eight thick layers of fabric, which does a good job of drowning out road noise at a variety of speeds. There’s also no need to worry about a reduced driving experience as our rental Volante features re-worked rear suspension that has been stiffened to ensure the car retains its characteristic sporty feel. Even with the roof down, this sports rental car is still very comfortable, unlike many drop-top GTs, you won’t get blown around with the roof down. 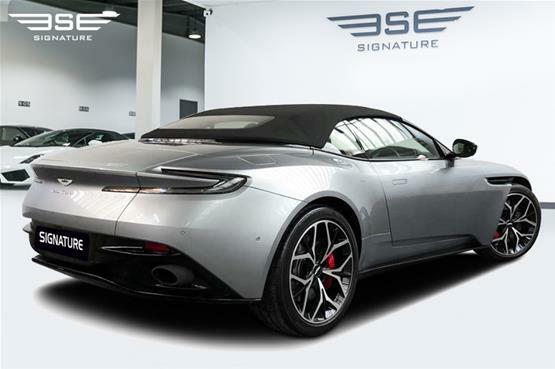 Buffeting is kept to a minimum even on the motorway, and with the roof up the double-glazed side windows and eight-layer fabric hood means the DB11 Volante is great choice for self-drive hirers looking for a long-distance tourer. 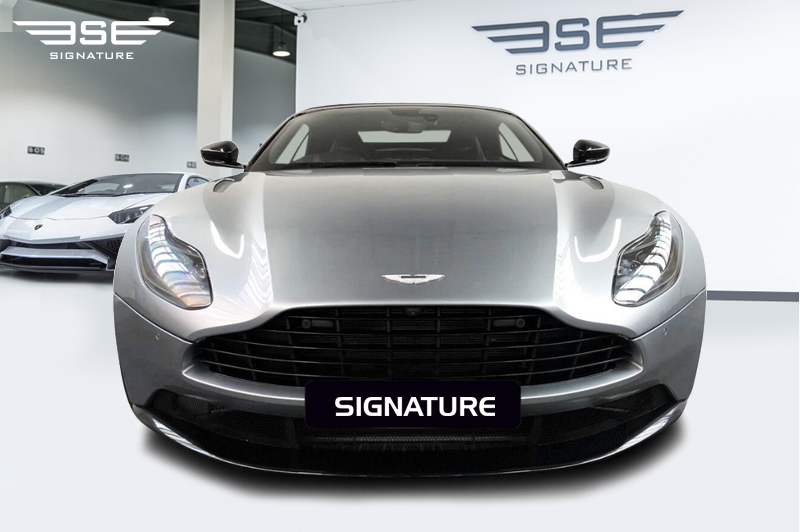 This model has a sharp contemporary and aggressive feel without losing any of the trademark Aston elegance. Intelligent aerodynamic design feeds air out of the front wheel arches, via the front wing vents, to reduce front axle lift, while inlets in the C-pillars channel air through the rear wings and out of the rear via the ‘aeroblade’ virtual spoiler. With a low-slung shape, long bonnet and short rear end this rental car is every bit an Aston Martin in its design. The Car provides aerodynamic efficiency to keep the car stuck to the road without having to add unattractive wings to the elegant bodywork. Adjustments of note include the DB11’s door sills, which are notably slenderer than its predecessor. The centre console is high and shapely and use high quality materials and keen attention to smaller fixtures and expensive feeling fittings which feature a satin aluminium finish. Aston Martin have placed lots of attention in to the interior quality, specially the application of leather which is more impressive than on previous models. The cabin is hand-made and features plenty of wood and leather, as you would expect from this high-quality Marque. Automatic parking brake is a new and a welcome feature, and there’s a close cluster of column stalks conveniently placed on the left of the steering wheel. Park, Reverse, Neutral and Drive buttons are located on the centre stack. Rear space has been improved thanks to the ‘plus two’ occasional back seats and head room has also been increased a little by reconfiguring the rear differential and fuel tank. If you are looking for a high-performance rental sports car in the UK, then our Aston Martin DB11 will not disappoint you! 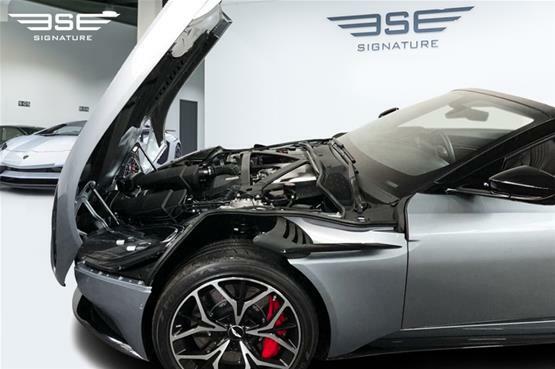 Thanks to the DB11s new 4.2L V8 engine and its excess of mid-range grunt it achieves an astonishing 4.1sec to 62mph, 8.8sec to 100mph and a top speed of 187mph. The turbocharged engine establishes a revenue of power which is effortlessness. There’s relatively no turbo lag to speak of, except at very low revs. Power achieves 503bhp at 6000rpm, while maximum torque of 498lb ft is developed as a flat peak between 2000-5000rpm. This rental DB11 from Aston Martin is bigger and better on pace, sporting desirability and driver engagement than other sports cars on the market. Sit back and relax, because you will enjoy the ride which is exceptional! The engine is taken from Mercedes-AMG and works well in the DB11. There’s a gentle growl when the car is idle, while throttle response is instant, and grip is good. Speed is not compromised, it feels fast and the different drive modes give this sports rental car more character. Moving through Normal, Sport and Sport+ for each (chassis and drivetrain) brings a firm response. In Normal the Volante feels calm, sounds reasonably serene and rides firmly. In Sport it comes alive generally, although you can keep the chassis in Normal and put the drivetrain in Sport, and vice versa, which is a nice touch. 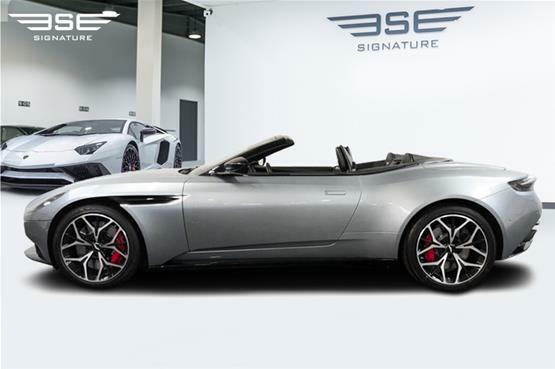 In Sport + mode for both modes the car sounds and feels aggressive, the mapping for the gearbox, throttle, transmission, exhaust and dampers all shifting to another level, making the Volante feel like a much more focused piece of machinery. Even though this is a droptop Volante model, the DB11 cockpit isn’t noisy but you will still be able to appreciate the car’s engine hum, so you can fully engage with a sports car rental feeling. Bigger door mirrors, assigned by new safety regulations, contribute to wind noise levels that won’t offend. The DB11’s grip, speed, balance and composure are also all top notch. 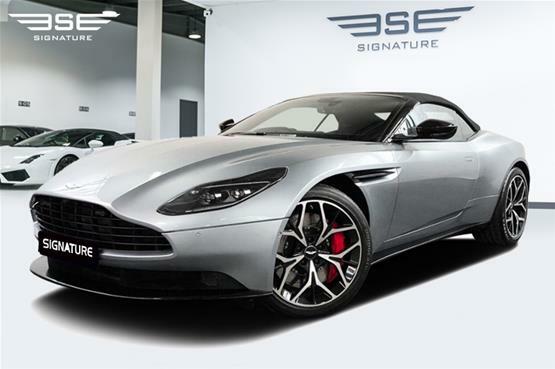 To rent our Aston martin DB11 Volante on a self-drive hire basis in the UK, either get a quote on-line or call us today on 0207 118 2244.